Creating and maintaining a safe workplace is not only good, common business sense; it is a legal requirement. We will guide and assist you in the task of keeping your company current and compliant with OSHA’s guidelines. OSHA enforces occupational safety and health regulations by inspecting workplaces, issuing citations, and imposing monetary penalties for violations of OSHA safety and health standards. Inspections are conducted by compliance officers, usually without advance notice. In states that have their own plans, inspections are conducted by state inspectors. Workplace inspections must be conducted at a reasonable time, generally during the employer’s normal work hours, and in a reasonable manner. When an OSHA compliance officer arrives for a workplace inspection, you have the right to deny entry and to demand that OSHA obtain a warrant to inspect the premises. OSHA may get a warrant from a judge in a simple and speedy fashion in advance of a proposed inspection or after being denied entry. Your failure to object to the inspection or ask for a warrant constitutes voluntary consent. Representatives of the employers and employees are entitled to accompany the OSHA inspector on the “walk around” tour of the workplace. The compliance officer may interview employees privately during the course of the inspection. 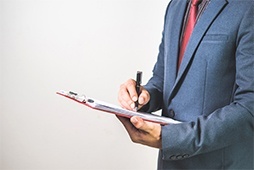 When an employer grants the inspector entry for a limited inspection, such as one responding to an employee complaint, it may object to expansion of the inspection to other areas of the workplace. If an employer allows the inspector to enter but objects to the inspection of certain portions of the workplace or interferes with or limits any important aspect of the inspection, such as the taking of photographs or videotapes, attaching sampling devices, or questioning employees, OSHA will consider this a refusal of entry. Small business exemption. In low-risk industries, there is a small business exemption from programmed inspections only.